Bueller, I miss you so much. There was never any drama. You were such a team player. You just did it. Merganser's Ferris Bueller MH, WC was our handsome big guy. Bueller completed his Master Hunter title at the age of three in July 2006 passing his first five Master tests without a fail. Bueller also has a Working Certificate title. Bueller was retired from competition in November 2007 after falling on river ice while pheasant hunting. Bueller underwent lumbar laminectomy surgery in January 2008. He still enjoyed hunting, training, eating, and lying around the house. Both of Bueller's parents are black Field Champions. Three of Bueller's grand-parents are black Field Champions. One of Bueller's grand-mothers is a chocolate Field Champion. Bueller's sire had 85 All-Age points as of December 21, 2003 and was a National Amateur Finalist in June of 2004. Bueller's dam had 3 Open wins in 2002 and 34 All-Age points as of December 21, 2002. 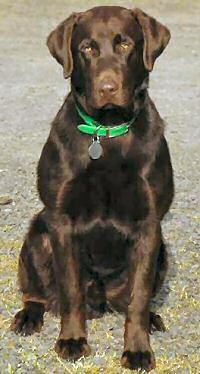 Bueller's pedigree is an exceptional outcross for the chocolate bloodline. Bueller weighed 100# and stood 25.5 inches at the point of the shoulder. Bueller is the sire of many Master, Senior, and Junior Hunters. Goodbye my friend…. You were such an exceptional dog.